“But I don’t want to go!” My seven-year-old Rebekah screamed as I woke her up at the crack of dawn for her very first swim meet of the summer season. She hid under her covers in a ball. After lots of dialogue and struggle, we drove to the meet. She remained nervous and anxious when we arrived and refused to let me help her put her cap on. I grew unsure of what we committed to. Will she back out of racing because she’s too scared? In no time, my friend Trisha scooped Bekah up in her arms and carried her to the tent where she’d wait for her heat to be called. Coach Brenda let Rebekah be her “helper” and she coached her on what it would be like on the starting block. She showed her exactly what to do. After “Swimmer’s, take your mark!” and the buzzer went off she jumped into the water and swam the 25 Freestyle. She didn’t stop at all and had a smile on her face at the end. I felt relieved and was so proud of her for overcoming her fears. She swam her backstroke and relay races with no complaints. Getting a free sugary snow cone from winning a heat helped too. This new experience taught me a whole lot about our faith in Jesus- more than I even realized. We must be willing to risk something. Signing my child up for swim league took a risk on my part. What if she doesn’t like it? What if she can’t do the hard work? What if, what if, what if… At some point, we just had to commit, and I needed cooperation from her. Rebekah had to risk diving into unchartered territory of the unknown. When we put our trust in Jesus, we don’t always know what he will ask of us. Will he ask me to give up an addiction, lifestyle, or way of living? Will he ask me to step out of my comfort zone and love on someone different than me? Will I have to suffer or struggle for a season of my life? Whatever Jesus calls us to do, we have to embrace risk and not run from it in fear. If we’re not risking something, we’re not fully living. 2. We shouldn’t compare ourselves to others. I found myself looking at the seasoned swimmers. 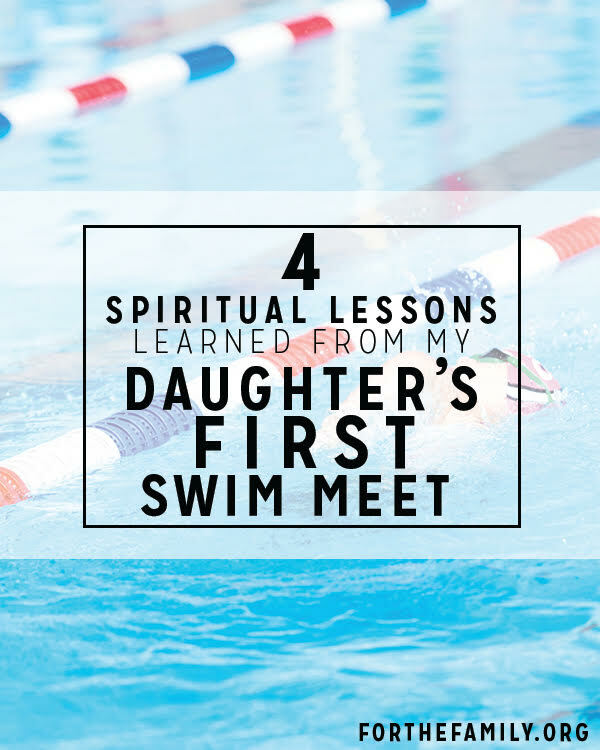 I’d been a swimmer my whole life and knew Rebekah would enjoy it too, but I had to remember this was her first meet. Butterflies were in her stomach, there were lots of people cheering on the bleachers, and anything new can bring anxiety. She had to swim her race – not anyone else’s. And thankfully a few seasoned moms shared with me their own stories of their kids at one point needing a barf bag before races! It made me feel better that we weren’t necessarily unique. In our faith, we’re all on different journeys. We struggle to various degrees. Our spiritual gifting and disciplines are all unique and that’s how God intended it to be. We need to be content with where we’re at and not wish we were in another person’s lane. God has us right where he wants us and is growing us in his timing. 3. We need each other. Before my daughter’s first race, there was only so much I could do as her mom to encourage her heart to be strong. It was because of the help of my friends and her coach (and prayer!) that ultimately gave her the courage to work through her fears. In our faith, we’re crazy to think we can walk this life without anyone by our side. On the days we think we’re crazy for following this man Jesus, we need to know that we’re not, in fact, lunatics. God has given us the gift of each other to remind us of his goodness and love and that we’re placing our faith in the person of Jesus. He is with us. He uses others to show us his grace in amazing ways. There’s such a beauty in leaning on others for help and strength. It’s up to us to accept that support. 4. We’re racing to win the prize. Following Jesus and placing our faith in him requires strict training – yes, this is contrary to popular theology today. We aren’t running this race of faith aimlessly, to always “feel good” or with an apathetic attitude. We have a goal to share the gospel with others and to live it out until the Lord takes us home to be with him forever. We’re racing to win the prize. The race is final, not a warm-up before the real thing. Our calling as believers is indeed a high calling and we’re not racing for a temporary crown, but an imperishable crown. And our final goal is Jesus himself. A few days after the swim meet, Rebekah received her first medal. “Ohhh!” she said as I handed it to her. She put it around her neck and smiled at it. She now understood that her hard work in all those practices resulted in something. The initial risk was now a reward to behold. « What’s Behind Your Child’s “Mad”?